Now that anyone with Internet access has a platform to stand on to share their viewpoints with the world, the challenge is for those with something of importance to say to break through the banal interference to be heard. No one knows this better than WikiLeaks founder Julian Assange, a man that rose to prominence after developing a mechanism for whistleblowers to be heard while maintaining their anonymity. Bill Condon's The Fifth Estate dramatizes the rise of WikiLeaks and its impact on world governments, corporations, the media, anarchism and, most importantly, the white-haired Julian Assange (Benedict Cumberbatch), the man that made it all happen. Based on two novels — former WikiLeaks spokesperson Daniel Domscheit-Berg's Wikileaks: My Time with Julian Assange and the World's Most Dangerous Website and WikiLeaks: Inside Julian Assange's War on Secrecy, from British journalists David Leigh and Luke Harding — both were written by insiders that had fractured relationships with Assange. The film begins with a seemingly frantic scene that depicts the day in 2010 where The Guardian, The New York Times and Der Spiegel were coordinating their timely release of classified U.S. military information that would catapult Assange into a dangerous international spotlight. We're then thrust into the recent past and introduced to the film's protagonist, Daniel Domscheit-Berg (Daniel Brül), when he first becomes involved with the WikiLeaks founder and commences his role as the organization's fact checker and media liaison. The first hour is preoccupied with the dynamic of Berg's relationship with Assange, chronicling how quickly he becomes enthralled with Assange, retreating into the shadows of idol worship and living out the standard thematic trajectory of adult coming-of-age/worldly disappointment. Berg is initially enamoured with Assange's promise that they'll forever change history, to the extent that he looks past his seemingly sociopathic tendencies and falls into a world where truth and deceit are often blurred for the greater good. For the most part, the re-telling of their relationship is too boring for the big screen, so Condon utilizes handheld cameras and an onslaught of rapidly paced montages that find the men travelling to a dozen or so European cities. In an attempt to keep things somewhat engaging for viewers, a subplot is inserted that finds two U.S. government officials (Laura Linney and Stanley Tucci) bouncing between Washington and Cairo, to give some context to the global diplomatic fiasco WikiLeaks would eventually cause. It isn't until the latter half of the film that things finally cohere, when U.S. soldier Bradley Manning betrays his country through his sharing of classified military cables to WikiLeaks. Of course, by this point, any attempts at thematic ambiguity or narrative complexity have been rendered moot. 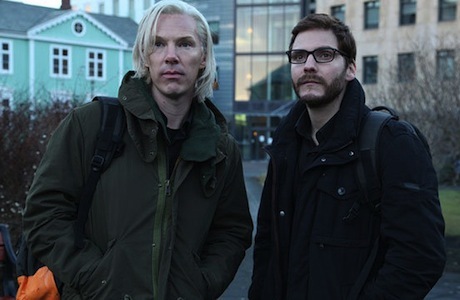 Condon's tepid handling of biopic material, inserting standardized morality and generic tropes, proves to be The Fifth Estate's biggest detriment. Anyone with an ounce of computer skill will find the insertion of technology into the film laughable (listening to the actors discuss the use of Final Cut to spruce up a video is awkward, as are repeatedly seeing scenes of desks that look like something out of The Matrix, complete with Dell computers running painfully old operating systems), ensuring that anyone interested in authenticity will be as alienated as those looking for a moderately compelling story. Even more annoying are the IRC chats between the actors with voiceover narration and text embellishments on the screen. Condon's depiction of computer hacking in the 21st Century is oddly reminiscent of 1995's Hackers and one can't help but question if he actually knows anything about modern technology.